There is no need to deal with the embarrassment of acne blemishes or be subject to the negative side effects of antibiotics. This fast acting, all natural cream may clear your skin and help keep it clear with just one or two light applications per day. Your order is processed the same day to insure fast delivery. Why wait? Clear and healthy skin is only a click away with no risk to you. If for any reason you are not satisfied with our all natural acne cream, please return for a full refund. AR Crème is made with all natural ingredients and extracts from around the world and is a very concentrated topical cream. AR Crème is most effective when only a very small amount is applied. After your skin has cleared, use a very small amount at bedtime to prevent the development of new acne blemishes, acne pimples, blackheads and whiteheads. No more 3 step programs or pills to take. 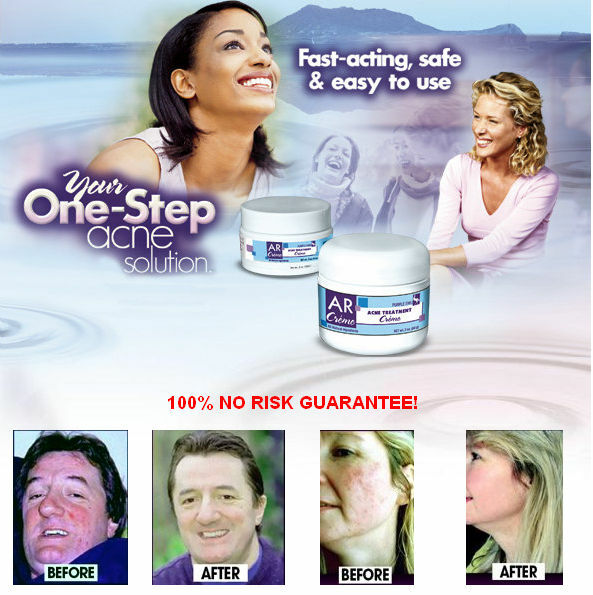 AR Crème is fast acting, safe and easy to use.